Smooth Ends are a London based band. They have just released their first EP, and to use their fine words it happened - "after lots of hard work and passion. We self produced the whole thing, from the music to the artwork, and everything in between. We are active in the London music scene, with lots of ideas and upcoming events". They continue - "We would like to share our music with you, since we know that you would appreciate the hard work behind it". Two things really impressed me about Smooth Ends. First of all their short and to the point message actually implied the passion was pretty genuine, secondly, the music. After all is said and no matter how much buzz you create, it's always going to be the music that counts. Well it is for Beehive Candy and we are impressed. (Facebook HERE). Announcing Bee Vids Beehive Candy's other page. What it is? - another page where music videos can also appear. It's just the start, there is no master plan, actually there is no plan, we are making it up as we go along. What it is not? - original, revolutionary, ground-breaking and definitely not the benchmark. However somewhere in the back of Beehive Candy's mind lurks the spark of an idea that may just up the game. Not yet though, time is in demand and 'the other page' will just lazily build and alter as and when it does. So take a look if you want, videos will come and go and hopefully some will spark your interest. You never know what might turn up. Beehive Candy would like to take this opportunity to apologise for the following unashamed plug. Actually that's not strictly true. Paper Garden Records (PGR) have as some of you have no doubt spotted, been a source of some great music that has appeared on this site in recent years. 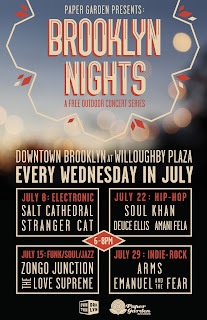 First of all, PGR have a series of free concerts in Brooklyn this July featuring - Salt Cathedral, Stranger Cat, Zongo Junction, The Love Supreme, Soul Khan, Deuce Ellis, Amani Fela, Arms and Emanuel and The Fear. In addition to the concerts, there's a chance to listen to some of the acts, to check out just what so many of us will be missing out on! Oh well there will be some with smiling faces, so good for them eh?. There's a real mixture here, Electronic, Funk/Soul/Jazz, Hip Hop and Indie Rock. I won't pretend everything is to my taste, however a lot is. So no apologies, just some very fine music. You can find out more HERE. What they say - Sydney based psych-rock trio The Walking Who (Rohin Brown, Jay(Bird) and Paul Mclean) announced a brand new single on Monday 'My Future Wife' alongside the news of a forthcoming UK/EU tour, which includes performing at London's Citadel Festival and a headline show for Communion Presents at The Old Blue Last on 22nd July. This will be the band's first return to Europe since their debut in 2014, which saw Maz Tuppuni of Communion/XFM proclaim it was one of his favourite gigs of the year. What we say - A psychedelic sixties vibe with alt rock quality, well that's what came into my head, this is an enjoyable track, big thumbs up from the Beehive. We are not exactly hot off the press with this song which was released in March, with the exception of the new official lyric video of 'Matt Simons - Catch & Release (Deepend Remix)'. After its release back in March, the track fully exploded on line resulting in millions of views on Soundcloud, Youtube and massive support throughout the blogosphere. The track stormed the Hypem Charts (overall) resulting in one number 3 and two number 1 positions in a row. Plenty of radio airplay as well. For no other reason than to brighten Beehive Candy up this Tuesday we unashamedly jump on the bandwagon. Better late than never with this excellent song! Some background - Lady Lowis a rock quintet comprised of Jimmy Sweet (vocals, guitar), Rachel Maxann (vocals, synth, bass), Eden Lee (vocals, drums), Kaitlin Wolfberg (violin) and Hannah Blumenfeld (violin). Sweet had always wanted to start a band that combined love’s passion and old school rock and roll. After returning to L.A. by way of London, he formed Lady Low. Maxann found her way to the City of Angels after growing restless in the Big Easy. She brought aboard her old friend Lee, and after enlisting the help of local string talents Wolfberg and Blumenfield, the world’s first romance rock group was born. Lady Low is not the first musical expedition for these romance rock pioneers. Jimmy has been rocking for years, starting out with legendary San Francisco rock band, The Richmond Sluts. He still performs with the Goodtime Boys, a ‘70s cover band, along with members of Hot Hot Heat, Fleet Foxes, The Heavy, and Beachwood Sparks. Jade The Moon tell us - 5 6 7 8 was written in a two hour session with no preconceived ideas about where the session would go. We had a lot of fun with creating this. I started dancing around the kitchen pretending to be a ballet dancer, singing 5 6 7 8 at the top of my lungs, which eventually became the backbone of the song. The remaining lyrical content can be difficult to hear, but on closer listen you can hear that there is an honest search for something tangible and real. Whether it's a search for love, happiness or just an escape from the everyday we found it for a brief moment. We say, looking forward to your debut EP this summer, on the strength of this, it's one to watch out for.